﻿ Translation Rates Per Word – What Do You Get For Your Money? The fact that you’re reading this page, looking for translation rates per word means, there is a high chance that you could be about start your first ever translation project, unless you’re just unhappy with your current language service provider. Professional translation seems expensive, so can I just use Google translate instead? Google translate is getting better every day, but it still has a long way to go to replace a human translator. Aside from accuracy concerns, when it comes to using a tool like Google translate, you have to think about non-disclosure agreements as well because who knows where that data/text go once you hit submit? 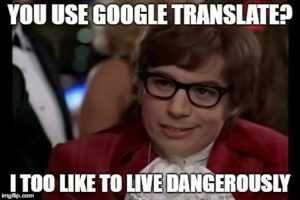 If you just want to get a rough idea of what a passage of text means in another language, then it’s fine to use Google translate, but don’t rely on it for professional uses because the dangers could be fatal. All human translations are carried out by professional native speakers who are paid on a per word basis, and the rates differ usually on the language or the skills of the translator rather than the industry e.g. medical translation rates per word for a document into French would but no different to the rate for a legal document into French. If you have a lot of words to translate, then the rate per word can decrease because more words carry more repetition (repeated phrases and sentences) and the discount is passed on accordingly. Also, the more translation projects you do with the same agency the better, because the rate will lower over time as previous translations will get recycled using CAT tools. What are the average translation rates per word for each language in ? The cost of translation can range from £100 to £160 per 1,000 words which is approximately 2-3 pages of A4 text depending on your language combination. Example Quote: if your document has 1,600 words and the rate for translation per 1,000 words is £109 (£0.109 per word) then the total translation cost would be £174. All translation agencies charge per word because it’s the fairest and simplest way to calculate fees as translation fees per page wouldn’t work because you could probably get thousands of words on one page if you change the font size to 1px. When asking for a quote make sure the translator/agency you choose for your project doesn’t try to round your project up to the nearest 1,000 words because projects should always be based on the exact word count. Translations rates per word can vary based on different factors, as discussed above, which means the final rate can be lower so always use standard rates as a ball park figure. Now you know how translation rates per word are calculated, who do you choose for your project? Unless you’re in a position where money is no object, you are challenged with getting the best results for the lowest price. In business there’s only two ways to make more money and that’s by either cutting costs or increasing revenue. 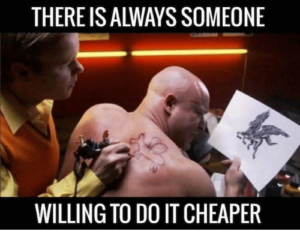 Chances are you will get sucked in by the lowest price because translation providers offer wildly different rates for what most people assume is the same level of service. You would think that it’s common sense that making a decision based on price doesn’t work if the services offered are different but it’s clearly not because most people would opt for the lowest price, no questions asked. Is desktop publishing (DTP) included? Does the translator have experience in your industry? Do the linguists work exclusively into their native language? Are the translators based in the target country? These questions are important and if your heading into your first translation project there’s a good chance you won’t think about any of them. Let’s take ‘Are translators qualified?’ for example, in some countries the translation industry is not regulated, so anyone can call themselves a translator, making it easy to be mislead. You wouldn’t want to risk a complete novice working on your legal, medical or technical document, for example, where errors could cost lives. Because of low barriers to entry, people who can speak two languages think this qualifies them to be a translator. At Tongue Tied (Manchester) we have over 25 years’ experience in the translation industry, so you can rest assured that you’re in safe hands and we would only place your projects with translators that have experience in your industry.